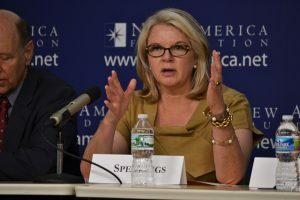 After Margaret Spellings’ political work in Texas and four years as the Secretary of Education, she became involved in private sector education, serving on the board of such companies as the Apollo Education group–the parent company of the for-profit University of Phoenix. Spellings’ critics have questioned whether that experience is appropriate for the President of a public institution like UNC. But others say the commercial experience can be an asset.